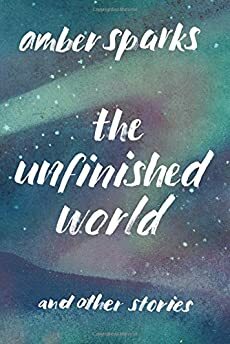 Largehearted Boy: Book Notes - Amber Sparks "The Unfinished World"
Book Notes - Amber Sparks "The Unfinished World"
The stories Amber Sparks new short fiction collection The Unfinished World are imaginative and richly told, fantastic in every sense of the word. "The strength of the collection is Sparks' lush, lyrical writing, saturating the dark, death-filled stories with beauty…. Stylish and deeply imagined." When I started putting together a Book Notes list of songs to accompany my book, The Unfinished World and Other Stories, I felt stuck because all I wanted to do was, well, listen to David Bowie. I was devastated when his death was made public, because no one's music and art – and life as an artist – has meant more to me. And so finally I said, you know, I bet I'm not the only person who just wants to listen to Bowie right now. And I'm going to make a list for those people. An all-Bowie list for my book. I have to admit, it was more than a little therapeutic. And appropriate, given what a reader Bowie was, how many literary references fill his lyrics and serve as his influences. And appropriate, too, given for me how much time spent writing has also been time spent listening to David Bowie, how much his music has no doubt seeped into the pages of my books and filled my words with weirdness. Anyhow, I'd normally explain each song, and how it fits each story. But in this case, I'd rather let the lyrics themselves do the talking. No need to explain – just read and listen and I hope, enjoy these songs and stories in a new way. But moondust will cover you"
They're the start of a coming race"
Was all that I feared"
Come get up my baby"
That we'd never close again"
But she's a queen and such are queens that your laughter is sucked in their brain"
'It's time we should be going'"
Gotta get a word through one of these days"
But our lives are valuable too"